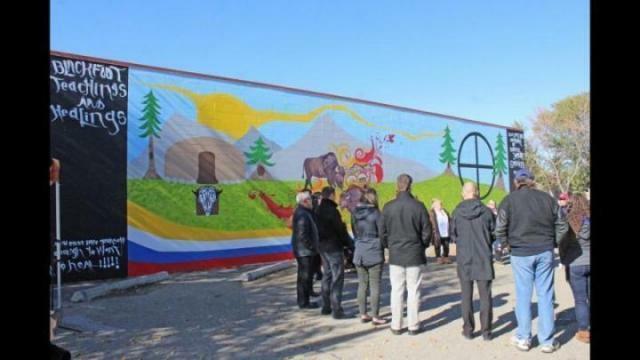 MURAL UNVEILING - The Red Deer Downtown Business Association announced a new art mural that was unveiled Oct. 3rd as part of the ongoing Art Alley initiative. Oct. 3, 2017 1:00 p.m. The Red Deer Downtown Business Association (DBA) announced the addition of a new mural to downtown Red Deer Oct. 3rd as part of the ongoing Art Alley initiative. Art Alley is a downtown beautification initiative that transforms plain alley walls into vibrant, hand painted murals. The project is responsible for ten murals since it began in 2014. The newest mural, ‘Blackfoot Teachings and Healing,’ is also one of the largest. Created by artists Ryan Jason Allen Willert and Cydnee Sparrow, it describes the teachings of the sweat lodge, the Blackfoot medicine wheel, the law of the four elements and Grandfather Son. It is dedicated, in loving memory, to Darryl Gauthier.